Blake Rudolph rebounds balls during Razorback basketball practice. Blake Rudolph can do the math. The University of Arkansas student will complete the Master of Arts in Teaching degree in May. He knows math teachers are in short supply in Arkansas and other states, too. As a senior at his high school in St. Louis, Rudolph took part in a program known as cadet teaching in which he served as a teacher’s aide. He taught math lessons the teacher prepared. He believes people who understand math well and enjoy it still may be reluctant to become math teachers because they think concepts are hard to explain to others. 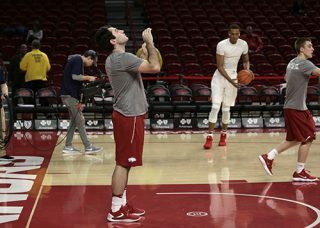 Rudolph played basketball, soccer and baseball in high school so, when he got to college, he added working as a manager for the Razorback basketball team to the equation. He has worked with the team for four years. He earned his bachelor’s degree from the U of A, too. Rudolph is doing a teaching internship at Fayetteville High School this semester. He didn’t travel to midweek games during the season but was able to get time off to attend the SEC tournament in his hometown of St. Louis. He traveled with the team to Detroit, where the Hogs will take on Butler today in the first round of the NCAA tournament. With going to school early, working during planning periods and asking teachers to give him additional tasks, Rudolph said, the give-and-take with teachers worked out well. “I’m very lucky; everyone has been helpful,” he said. Working as one of seven managers for the team has helped him prepare for teaching and coaching, Rudolph said. That means making sure equipment and uniforms are ready for use, setting up and taking down equipment for practice and working in the coaches’ offices. Laura Kent, an associate professor of math education in the College of Education and Health Professions, described a dire situation in which fewer students are choosing mathematics teaching than in previous years. According to the Arkansas Department of Education, there was almost a 16 percent decrease in the number of new math teachers graduating from Arkansas universities from the 2015-16 school year (146 teachers) to the 2016-17 school year (123 teachers), Kent said. The numbers were from initial licensure data for grades 7-12 in mathematics. “I do not know if this trend will hold up, but it does feel dramatic to me, especially given that there is already a shortage,” she said. She hopes to have more students like Rudolph. Please contact Kent at lkent@uark.edu for more information about the secondary mathematics M.A.T. program at the University of Arkansas.